So just when some of us had probably started to wonder if dear old Phillie Younghusband had been suffering from amnesia and had forgotten the route to goal, he pops one as though to gently remind us that he is, by far, still our top marksman. Granted, the goal was not from open play; but the expertly curled freekick was as exquisite as they come, over the wall and down into the lower right corner of the goal away from the reach of the desperately diving Turkmenistan goalkeeper Farkhat Bazarov. The freekick was won in the 48th minute by Patrick Reichelt, omitted from the starting line-up but sent on after injury to Ruben Doctora Jr. in the first half. Reichelt kept his nerve after being sent through by a pin-point pass from the back, and was fouled outside the box as he tried to find shooting space. Younnghusband almost got himself a brace just four minutes later after being sent through on goal by an inventive pass from who else but Stephan Schröck. There will be some concern, needless to say, about the coming semi-final against the home team Maldives. Whatever fervour that the partisan crowd can generate to try and lift the home team, however, cannot possibly more intense than the atmosphere that the Malaysian crowd created in a recent international friendly against the Philippines in Selayang. The first shot was initially blocked by the advancing Bazarov, but Younghusband was allowed to pounce on the rebound with a weak shot on the turn. The ball was heading towards the corner but slowed down as it neared goal and was cleared off the line. Reichelt sealed the victory in the 72nd minute with a goal for the compilation videos. Martin Steuble curled a diagonal cross behind the Turkmenistan defence and Reichelt stretched out to stab the ball in on the volley. Turkmenistan saw more of the ball early in the match but were not really getting behind the Philippines defence, superbly marshalled by captain Rob Gier and the 19-year old Amani Aguinaldo. The superb Roland Müller was the busier of the two goalkeepers but was only really stretched once in open play. This was in the 21st minute when he sent Ruslan Mingazov’s diabolically struck shot from distance over the bar with a reflex save. The only other time when he was called to make a telling intervention was in keeping out a mystifying penalty awarded to Turkmenistan by the fussy Malaysian referee. 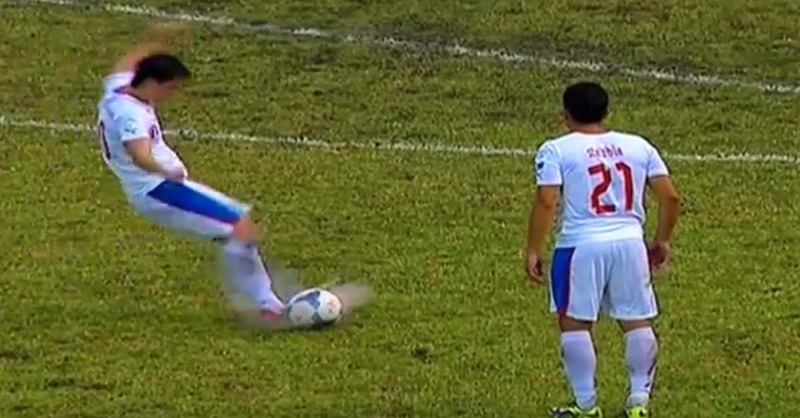 Müller dove to his right to keep out Aleksandr Boliyan’s shot and the rebound was fumbled away by an ecstatic Philippines defence. Had Müller not saved the shot, the penalty could have changed the complexion of the match and tainted the tournament with controversy particularly if the Philippines had been sent packing. Müller was cat-quick in palming out a freekick conceded by Aguinaldo in the 77th minute, but replays showed that the ball was probably curling out, anyway. The result was ultimately a deserved victory for the Philippines, who kept their shape and were full of verve in stark contrast to the almost lazy performance against Laos. In the end, the Turkmen did not really have it in them to spring a surprise against the Philippines, who they defeated in the semi-finals of the 2012 edition of the same tournament. As in their 1-3 loss to Afghanistan, the Turkmen showed that they were comfortable on the ball in the middle third of the pitch but did not really possess the creativity to unlock well-organised defences. But for Mingazov’s 21st minute effort, their shots from distance were not really going to trouble a goalkeeper of Müller’s calibre. It is interesting to note how expertly Thomas Dooley has been playing the tournament rather than each individual match, probably at the expense of aesthetics. The constant rotation of personnel might have compromised understanding on the pitch – as we all saw against Laos – but key players are being kept reasonably fresh and safe for later. Stephan Schröck, for instance, was substituted as early as the 64th minute against Turkmenistan, when the Philippines were up only by one goal. By doing so, Dooley showed great reading of how the game had ebbed and flowed along with understanding of the opponent’s strengths and weaknesses. Moreover, in substituting the team’s lone Bündesliga player, Dooley made a loud declaration of faith on the ability of the remaining players on the pitch to see the victory through. His faith was duly rewarded with Reichelt’s stunning goal; and when Farhad Italmazow was shown a second yellow in the 78th minute, there was simply no way back for Turkmenistan. While the Philippines have not play anywhere near the champagne football that many fans probably wish they would, the fact remains that the Philippines had – dodgy officiating apart – a reasonably comfortable passage to the semi-finals to finish top of what has been called the tournament’s group of death. Even if the Philippines do not win the Challenge Cup – and it will take a deranged man to bet against the team – what is obvious to all and sundry is the depth of the squad that Dooley has created. Jerry Lucena would have been favoured to step into the backline after injury to Juan Guirado, but Dooley kept faith with the teenager Aguinaldo, who stepped up bravely to do a man’s job. Daisuke Sato, Simone Rota and Steuble, of course, have been the squad’s recent revelations. Acknowledgment: Pictures captured from videos on the AFC Hub on YouTube.